The 350 Colorado staff, board of directors and team leaders from across the state recently gathered near Salida, Colorado for our annual 'Convergence' to plan for the year ahead. 350 Colorado Board of Directors, State-wide Team Leaders, Staff and volunteers gathered near Salida for the annual planning ‘Convergence’ a few weeks ago. 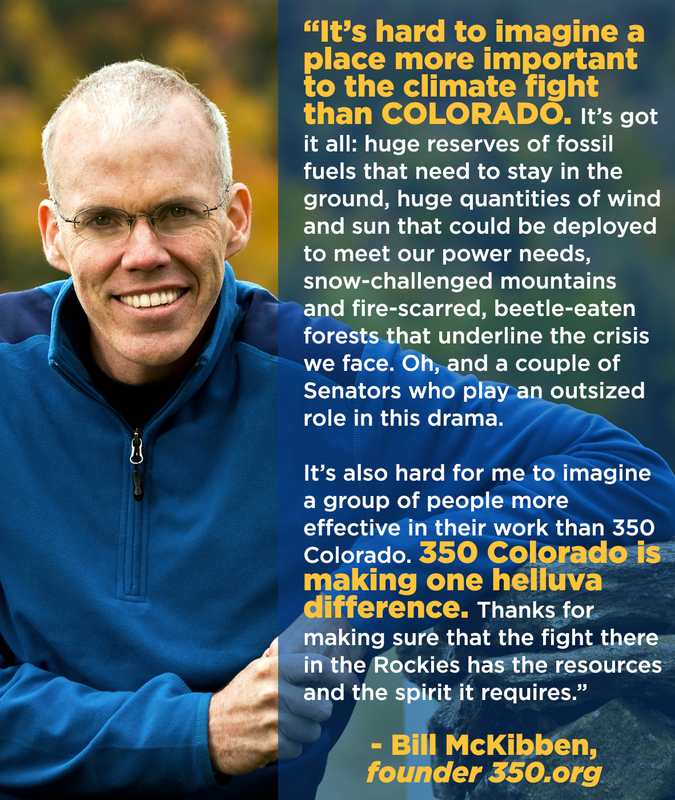 The following blog post is a guest post from 350 Colorado Board Member Bob Parker, who also heads up 350 Central Colorado with his wife (and fellow 350 Colorado Board Member Kay Parker). Thanks to Bob for sharing these reflections from 350 Colorado’s annual “Convergence” – a weekend of strategic planning coupled with reflection and celebration near Salida, Colorado. Recently, 350 Colorado held its annual Convergence – at our house and our little local community building. As most of our friends who are 350 Colorado Board Members and Team Leaders live in a city, sharing our rural mountain community for the weekend is not only meaningful but also great fun. Folks began arriving in the early afternoon Friday and continued to arrive through the evening until one thirty in the a.m. when Micah Parkin, our Executive Director, Julia Williams, our Volunteer Coordinator, and Irina Sedova, our Vice President of the Board arrived. Throughout the evening we ate tacos, met new leaders and caught up on stories with our friends dating back five years when we first became involved with 350 Colorado. Most camped on our land at ‘Itty Bitty Lakes’ either down on the banks of the Arkansas River or by our ponds. An evening to unwind from city and highway put everyone in great spirits for the work to be done on Saturday. Saturday morning, joined by several members of our local 350 Central Colorado team, we met at the Coaldale Community Building, our community’s 1922 redbrick schoolhouse. We have fully restored it to original condition and added a beautiful kitchen and upgraded bathroom. Sunflower umbrellas grew along the front sidewalk for our event. Breakfast was laid out while new Board members went through Board orientation. We welcomed new Board members Emma Ruffin, Amy Gray, Jacob Foreman and Emma Bray – all lifting us to a whole new level of dedication and enthusiasm. To me the most amazing beginning to this Convergence was Micah’s and Julia’s telling of what they and Colorado Rising went through to get Initiative 97 (now Proposition 112) on the November ballot. This is the proposed setback of fracking from schools, play grounds, athletic fields, hospitals, homes and waterways. We needed about 98,000 signatures. The fracking industry went all out to block us. They ran a commercial and newspaper campaign filled with lies about how safe they are. The teams endured. The fracking industry bought off the companies Colorado Rising had hired to gather signatures. One company was not only bought off but then did not pay its employees, left the State and took between 15,000 and 20,000 signatures with them. Colorado Rising went public and enlisted Joe Salazar, who made it very clear on the steps of the Capitol Building in Denver that we had complete documentation and the stolen signatures must be returned – and pronto – or else. They were returned. Another company was then bought out by Fracking. Signature gatherers were paid off to not actually get signatures. 350 Colorado Action stepped in, Micah got our license to be a signature gathering organization, an all hands-on deck call went out. Julia, Micah, Gina and others of our team were working into the nights and all through the nights. We prevailed with over 171,000 signatures turned in to the Secretary of State. This is a definition of Convergence, “The convergence of different ideas, groups, or societies is the process by which they stop being different and become more similar.” When applying the term to 350 Colorado, our Convergence is a gathering of board members and leaders of each of our seven local teams spread over Colorado. It is also a gathering of our grassroots experts in Movement Building, Keeping Fossil Fuels in the Ground and Promoting Local Solutions. Movement Building is our organizing arm. It is very important as it is the “backbone of achieving success in our other campaigns.” Keeping Fossil Fuels in the Ground includes working to end coal production while retraining coal miners; reducing the expansion of fracking and other gas and oil infringements abuses to our fellow citizens and to the other species who share Earth with us like stopping the building of more gas and oil pipelines and bomb trains; promoting divestment from fossil fuel corporations by large and small investors around the world; working to change the laws of the land that currently allow pretty much free rein of unfettered growth of the fracking and fossil fuel industry. Promoting local solutions is aimed at locally taking back our communities, establishing the widespread use of energy renewables, transitioning to locally owned power and local food systems. It’s all about sustainability. People working as individuals toward these goals can be easily blocked and refuted by industry, but activists coordinating together both on a local and statewide basis to bring in the countless thousands of folk across the land who believe Earth and people both have a future without fossil fuels – there lies the strength to bring about the change we must have for our tomorrows. Saturday evening we shared a great vegetarian meal under our huge trees and then we moved to a campfire party beside our ponds and under our massive willows. In a small antique schoolhouse, a beautiful old campground and the funky home of two of our activists, we reported, we listened, we laughed and we even cried. We sang, we ate, we told our stories and drank together. We bonded as one team to continue to take on the most powerful, well-funded industry in the history of the world. Thanks to Bob and Kay Parker for hosting this year’s 350 Colorado Convergence – and to Bob for this guest blog post!